LG Display has been very bullish on OLED TVs for several years now, and recently the company announced a major shift in focus towards OLED technologies, with a planned investment of $8.5 billion in the next 3 years. The company's CEO, Dr. Sang Beom Han, gave the IFA 2015 keynote speech, and he was very enthusiastic on OLEDs. During his speech, Dr. Han said that "OLED will bring revolution to people’s lives" - as it's the only technology that offers enhanced images combined with dynamic form - mainly transparency and flexibility. LG Display acknowledges the fact that it chose a difficult path in pioneering OLED technology, but they are proud in achieving the goal of making a display that realizes people’s imagination and dreams. He predicted that OLED has a bright future. 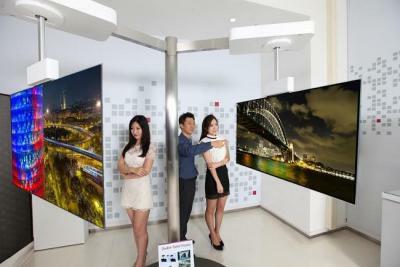 At the trade show, LG Display also presented some new OLED prototypes. First up is the 111" double sided "Wave" you see above - which is made from three attached 65" 4K OLED panels. It seems double-sided OLEDs are a thing now - LGD also demonstrated a 55" double-sided OLED display aimed towards commercial/retail applications. The whole display is just 5.3 mm thick and weighs just 12 kg. 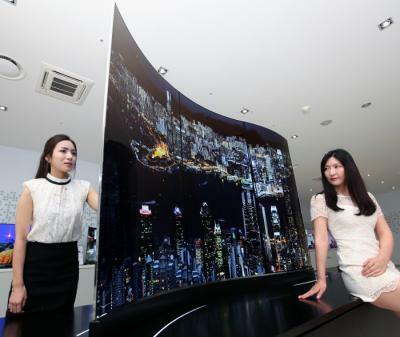 LG also demonstrated its 55-inch "wallpaper" OLEDs which were first unveiled in May 2015.